The Right Honourable Joe Clark was elected eight times to the House of Commons of Canada, serving as Canada’s youngest Prime Minister and one of the most distinguished Foreign Ministers in Canadian history. He was Prime Minister of Canada from June 4, 1979 to March 3, 1980 and Secretary of State for External Affairs from 1984 to 1991, then becoming Minister of Constitutional Affairs. He has also served as Acting Minister of both Justice and National Defence. At home and abroad, he earned and maintains a reputation for integrity and principle. Joe Clark played a key role in some of the defining accomplishments of recent history – the Commonwealth campaign against apartheid, the Free Trade Agreement between Canada and the United States, the Ottawa conference which agreed on the “two plus four” formula to unite Germany at the end of the Cold War, and the negotiation of the Charlottetown Accord in Canada, a complex Canadian constitutional accord among the Federal Government, the Provinces and Territories, and indigenous peoples. He connects Canada’s past to our future and speaks passionately of the potential of modern Canada to make a real difference in today’s complex and challenging world. Today, he applies that experience in promoting democracy and encouraging innovation and practical reforms in the developing world, and at home. He was a founding member of Canadians for a New Partnership, and continues to draw together Indigenous and other Canadians, and has led Election Observation missions in Africa, Asia and the Americas. He chairs the Awards Jury of the Global Centre for Pluralism, is a member of the Electoral Integrity Initiative of the Kofi Annan Foundation, and a member of the Friends of the Inter-American Democratic Charter, and other not-for-profit organizations. 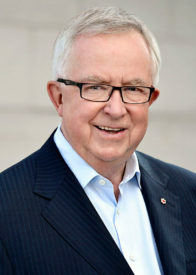 Joe Clark is Vice Chair of the Global Leadership Foundation, Chairman of the Supervisory Board of Meridiam Infrastructure Africa, serves on the boards of Canadian companies GlobeScan and Lumenix and on a number of Advisory Boards, including that of the Institute for the Study of International Development at McGill University. A respected commentator on public affairs, his most recent book is “How We Lead: Canada in a Century of Change”. He is a Companion of the Order of Canada, a member of the Alberta Order of Excellence, and of the Ordre de la Pléiade, and is an Honorary Chief of the Samson Cree Nation. He is married to the Canadian author and lawyer Maureen McTeer, and is President and founder of Joe Clark and Associates, an international consulting firm based in Canada.